Weather Station made it simple to plan your day according to the forecast. Well, There’s one problem. Choosing a good Weather Station isn’t an easy job. That’s the reason, Why I have created a list of Best Weather Station in 2018 which suits you and we prepared a comparison table. I’m an amateur weather blogger who loves to get wet in the rain as we live in the equator region where the rainfall is rare. After lot’s of researching and using plenty of weather gears, I decided to share the top weather instruments which you can buy without any second thoughts. How to install my Personal Weather Station? We have listed the products which are worth the price and the best you could get. With that being said, We have a strict process before listing it because we want to make sure that our readers should get valuable content. We make sure that the weather station is accurate, other users opinion, warranty, reliability, connectivity, list of sensors, wireless range, installation process and many more. Weather stations are required to provide the weather forecast in a particular area. They are also often installed in the backyard to forecast the future atmospheric conditions. The weather station should be able to provide accurate reports, or else it will be of no use. Weather Monitoring Station is most commonly used among the farmers, meteorologist, weather geeks, restaurants, construction builders. People can predict the weather conditions in their locality. Weather stations are available in a variety of designs, sizes, and functions. To make sure you are picking the right one for your purpose, here are some of the factors you will want to keep in mind. Both, wireless and wired, have their own set of pros and cons. Wired stations can accommodate only a limited number of sensors including three to five standard sensors and the additional UV sensors and solar radiation. It would be wise to buy the wireless model if you think you might need more sensors in the future, such as soil moisture or temperature sensors. Wired models also limit how far the anemometer can be mounted from ISS (which is typically 40-42m maximum). 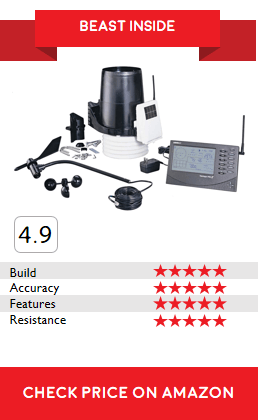 If you would like to position the anemometer farther, the wireless weather station is a more reasonable choice for you. In case of wireless stations, the reliability of the reception is challenged by the obstruction between the console and ISS. Concrete walls and other solid obstructions intervene in the transmission path and lower the reception range. Sheet metals and reinforced concrete tend to block the signals completely. Therefore, it is important to take these factors into account before installing the outdoor unit. Wireless weather stations are easier to install and also offer more convenient data collection. They can broadcast the data to any number of displays or receivers. The wireless models are used primarily for the ease of setup and installation they offer. They cannot be relied upon for the long distance transmissions. Their typical range of transmission is 200 to 250 meters in the clear line of sight. However, you can use the repeaters to increase the reception range. Each repeater will enhance the range by nearly 250 meters. You can also buy the long range repeaters that can transmit the signals over 1km distance. But, they also require a direct line of sight and cost significantly higher. The cabled models use the thin, ribbon wires to connect the console to the ISS. The supplied wire length is usually 30 meters. Cable length can be extended to up to 300 meters (which is also the maximum transmission range.) But, that is a lot of wire to handle and will require special care. The wires are thin and prone to easy damages. You may need to pass the cables through special conduits for added protection. The additional cable length, added protective materials, and more labor-intensive installation can have a considerable cost impact. Given that the wireless stations cost only nearly $100 more and offer longer transmission/reception range, they are rapidly becoming the preferred choice of the users. Sensors are inarguably the most important aspects of any weather instrument. The sensors provide the data pertaining to the weather conditions in the area where they are installed. Typically the basic weather monitoring stations come fitted with three sensors, namely hygrometer for humidity, a thermometer for temperature, an anemometer for wind speed. More advanced weather stations also include wind vane to gauge wind direction and barometer to measure atmospheric pressure. The high-end and more sophisticated stations also include ceilometers to measure cloud height, visibility sensors, rain gauge to measure precipitation, pyranometer sensors for solar radiation, UV sensors to measure the depth of snow and more. 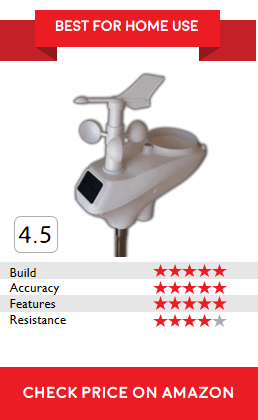 The basic weather station with three standard sensors is good enough for most users. Humidity, temperature, and wind speed are the parameters most of us are usually concerned about. However, there are certain places where the UV radiations are high. Thus, weather stations with solar radiation sensors are preferable for such areas. The frequency of update is another factor you would like to keep in mind while buying the weather monitoring station. The primary objective of the weather station is to keep you up to date with the current weather conditions. While usually, the weather conditions do not always change suddenly, there are times when they do dramatically. The station that takes hours between two readings may not be the right choice for many, especially for those who live in the area that witnesses capricious weather behavior. Certain weather conditions like snowfall and rainfall are usually unpredictable. Therefore, it will make more sense to buy the station that is quick to update lest you should face any inconvenience. The frequency of update may also vary across the parameters. For instance, most weather stations update the wind direction and speed in shorter intervals of 3 to 4 seconds, but take longer time to update other variables such as humidity and temperature. Most of the modern weather stations are capable of generating weather forecast, but the results are not always accurate. The basic stations may take only the barometric readings into account to forecast the weather, which is often inexact and somewhat misleading too. On the other hand, more advanced stations would factor in various parameters, such as wind speed, rainfall, humidity, and barometric speed for weather predictions. While the forecast even by these stations is not necessarily perfect, it is certainly more accurate. Some weather stations use more involved technology for weather forecasting and provide more precise results. But, they also cost a lot more than the regular stations. The construction and design play an important role in determining the accuracy and durability of the weather station. The sensors are always placed outdoors and hence are always exposed to elements and other weather conditions such as rain, heat, and solar radiation. This not only makes them more vulnerable to damages but affects the accuracy of the results as well. This is why it is important to shield the sensors properly and ensure that there is sufficient ventilation. A good quality station has the strong and sturdy design to thwart the impact of the elements and effective heat and UV cover for the sensors. Some advanced stations also feature the aspirated fans in order to maintain the temperature inside the sensor housing. The choice of the weather station depends on your needs. There is wide variety of products for various purposes. Let’s take a quick look at them. All the below weather station are the same with the basic sensors and features. But some weather stations are specifically designed for professionals with plenty of advanced features, for example Davis weather stations are usually comes with lots of advanced features which is most beneficial for weather geeks and enthusiastic. Nearly all the weather forecasting station in the market these days are digital. It feature a digital display and provide more accurate updates. Digital stations are available in a wide range of styles and models; from simple digital stations for general use to more involved ones for scientific purposes, there is everything you need. Digital stations provide time display, forecasts, and a lot of other readings pertaining to the weather conditions. Professional stations are primarily used by the companies or industries that are affected by or rely on the meteorological readings. They are also used by certain organizations for onsite weather updates to enable them to take appropriate operational decisions concerning public safety. Professional stations are more advanced, provide more accurate updates, and feature more sensors than the home stations. In addition to the standard sensors, the professional stations may also use ceilometers, rain gauge, pyranometer, and volumetric water content sensors. Home Weather Stations are principally used in the homes or in small offices. Unlike the professional stations, the home stations typically use only the basic sensors for standard weather updates. These stations are relatively inexpensive and provide weather atmospheric readings pertaining to temperature, humidity, and wind speed. Certain more advanced home stations may also feature wind vane and barometers to depict wind direction and atmospheric pressure respectively. Wireless stations are battery operated and, as the name suggests, incorporate sensors that transmit the weather data wirelessly to the central display. They are easier to install and offer more flexibility in number of sensors they can support. Wireless stations can also be easily configured with multiple displays. 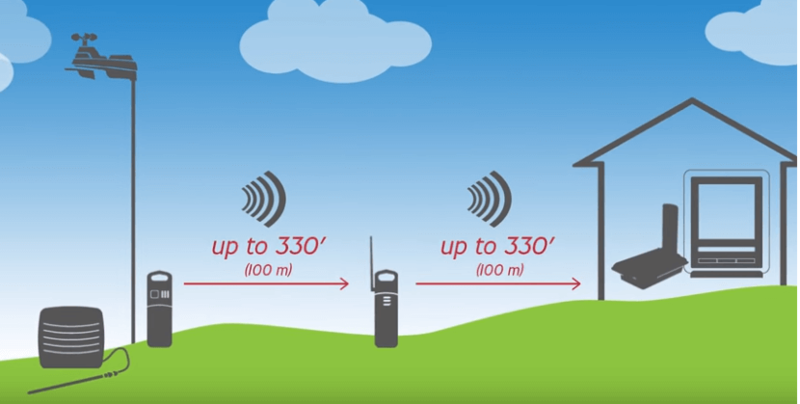 The reception range of the wireless stations is usually up to 250m, which can be increased with the help of the repeaters. It is important to make sure that there are no obstructions in the transmission path, as it may affect the reception quality. Wired stations use cables for transmission of the data from the sensors to the display. Wired stations are more difficult to install and manage and they are rapidly becoming outdated. Cabled stations are relatively cheaper as compared to their wireless counterparts. However, they are also limited in functionalities. For instance, their transmission range is limited to 300 meters. It is also difficult to connect them to multiple displays. My main intention with this website is to provide you with informational content which helps you to know everything about the weather station. I’ve tried my very best to remain informative without making you bored with the unnecessary content. Hopefully, you will find this article helpful when it comes to choosing the weather station. Before choosing the product, you should first be sure of what you’re getting and whether it’s worth the price you’re paying. We covered almost all the weather station reviews in-depth. 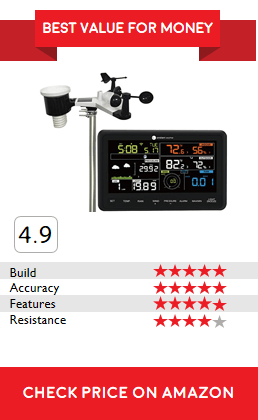 Ambient Weather Station WS -2901 impressed our research team with such a amazing build-quality. Ambient is way ahead of the weather station market and setting as a example for other brands. Ambient is the FIRST weather station brand that implemented AI voice assistant such as Google Assistant and Alexa. You can get the weather data by voice commands now. You can simply ask "Ok Google, Outdoor temperature" and it'll retrieve the data from the weather station. How cool is it? It has all the basic sensors and the LED displays all the information's such as Indoor & outdoor temperature, humidity, rainfall, wind speed & direction, etc. It updates the wind data every 16 seconds. ​❝ ﻿﻿Advanced and Modernized Weather Station. Extremely accurate and considerable durable. Superior customer support personnel; easy maintenance. The position of the LCD display screen is unfriendly; hampers convenience. Davis Instruments 6250 is one of the best out there, it's from a reputed brand operating since 50 years. Davis brand thrives to provide a solid build quality. Vantage Vue 6250 comes with lots of advanced features. We've tested in our labs and it was extremely reliable and accurate with the data. You can mount it on your rooftop or any other places, it has a advanced transmitter which allows to cover 1000 ft (300 m) distance. The best part is, it updates weather data every 2.5 seconds whereas other brands model update every 5-16 seconds or more. I'd say this is BEST one for experts because of the advanced features. It comes with all the required sensors such as Thermometer, Anemometer, Rain Gauge, Barometer and Humidity. I'm using it since 2009 and i gotta say this is the one that has the best durability (I live in Texas where we have extreme weather). I'd highly suggest you to go with Davis Product if you're looking for a solid-quality weather station, however price and quality doesn't go along. ❝ ﻿﻿Using it since 2009, still strong! Period. AcuRite introduced this model recently (Jan 2017). AcuRite 01024M comes with all the basic sensors and features such as temperature, humidity, barometric, rain gauge, anemometer. AcuRite is a brand that i love personally (Not being paid to say this) because AcuRite always comes up with innovative products which won't burn your wallet. One of the new feature is, Lightning detect﻿﻿or. It will alert you, if there's any lightning detected within 25 miles (40 kilometers) from your home. Cool feature, right? This feature has been introduced by AcuRite and no other commercial weather station doesn't have this feature (yet). Display Console got a new design and the screen looks really good. It's a HD LED screen and easily readable from 20 feet. Unleash the weather geek in you! 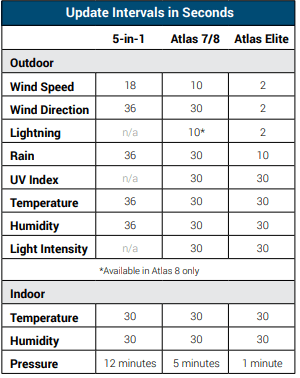 Davis Vantage Pro2 is a wireless professional weather station with a wide-range of options and sensors. It's perfect for professionals because of it's advanced features. It has all the basic sensors attached to the weather station. Wireless transmission upto 1000 ft from the outdoor weather station to display console and updates weather data every 2.5 seconds. You can also opt for wired transmission which completely upto you. 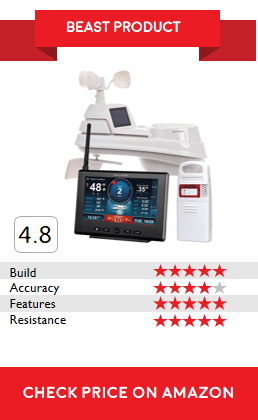 Davis Vantage Pro2 gives the most accurate readings according to our test. We all know Davis Instrument products are top notch. The only con with this model is the price. It's expensive. If you're fine with the price, then go ahead and it'll last longer. ❝ ﻿﻿Ideal for every weather geek. Expensive though..
Ambient brand is one of the most commonly used brand for weather instruments. Ambient Weather WS-1001 is based on WiFi to transmit the data from the outdoor unit to the display console. However, Internet Connectivity is not required. The outdoor unit transmits outdoor temperature, humidity, wind speed, wind direction, rainfall, UV and solar radiation to the display console. The data can be exported to SD card in Excel file format so that you could analyse the weather trend surrounding your home. You can also share your real time weather data through WUnderground. ❝ ﻿﻿From a Beginner to Geek, Everyone will love it. Plan your day with confidence with AcuRite 01512 Pro Color Weather Statio﻿n. It has 5-in-1 weather sensor which accurately measures five different conditions, including the Temperate, Wind-speed, Wind Direction and Rainfall. The Illuminated LCD Display features your weather condition surrounding your house, Wind Speed, Wind Direction, Indoor & Outdoor Temperate, Humidity, Heat Index, Dew Point, Wind Chill, Rainfall Data, Barometric Pressure. The Weather Ticker under the LCD display features the real time data such as feels like temperature, comfort level, wind speed and more. 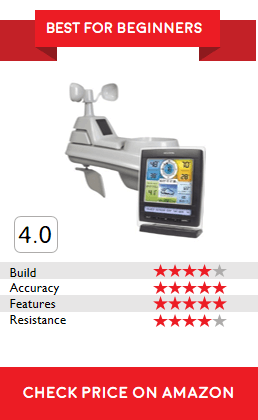 AcuRite is one the top brands when it comes to weather stations. There product quality is really good. 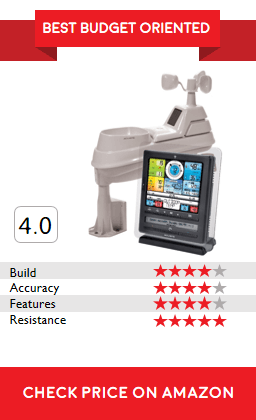 AcuRite 01036 PRO is solid choice as it provides accurate information's right from your backyard. It has 5-in-1 integrated sensors that accurately measures and gives comprehensive information of the condition surrounding your house such as Rainfall, Humidity, Wind Direction and Outdoor Temperature. You don't have to connect all the sensors separately as it is all fixed into 1 sensors. You can also connect it to your Windows PC which allows you to transfer data and stream your local weather online. AcuRite has implemented the most advanced self calibrating technology in this model. Actually i was quite surprised by the price. It's the most affordable weather station you could get. I wonder how AcuRite was able to manufacture such high quality price for this price, whereas the competitors are selling for triple the price. If you're a beginner and low on budget, this is the best choice you could get. AcuRite 02064 was announced recently and got alot of attention from the consumer. 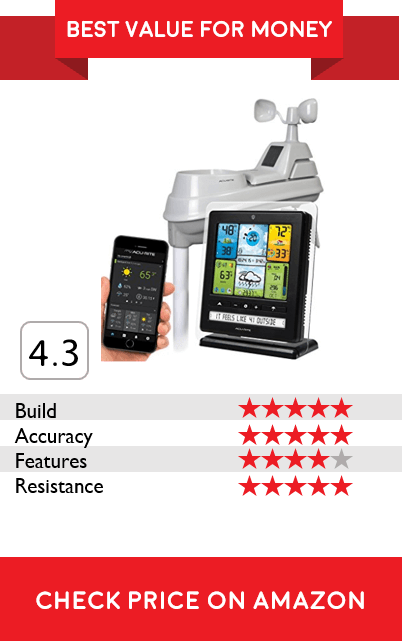 AcuRite is in the Weather Station industry for years. I contacted a bunch of Weather bloggers and most of them were using AcuRite as their primary weather station because it's affordable and much reliable compared to other weather station in this price range. You can track your weather information on AcuRite Weather Monitoring App on your Android smartphone and you can also connect it to Wunderground to track your weather in real time. It has all the required sensors and particularly it's quite easy to access the data in this 02064 model. The modern, personal weather stations are easy to obtain and easy to set up too. The detailed instruction manual is shipped with the packaging. The personal weather stations usually do not contain complex parts and can thus be installed without requiring any professional assistance. Yet, there are a few details the buyer must be acquainted with so that he or she may sidestep any associated hassles. In this article we learn how to install a weather station and the things to keep in mind during the process. Location is probably the most important aspect to consider before starting with the installation process. The outdoor sensor unit must be placed in such a way that the ambient conditions are accurately recorded and there are no obstructions. For instance, if you place the weather station under a tree it will not be able to record the rain data correctly. Or, a weather station placed in a narrow passageway will be affected by the wind-tunnel effect and will capture incorrect wind data. It is important to install the weather station in an open space. If you’re in an extreme weather region, you should make sure it should capable of withstanding storms and cyclonic winds & gust. In order to capture the accurate data, you will need to find a proper place for the installation. The process of determining and finalizing the location for weather station installation is referred to as sitting. This process plays an extremely important role in making sure that you get accurate weather readings. Even the most expensive, high-end and high-quality weather stations will fail to provide accurate data if they are installed at the wrong location. Most people go wrong with the thermometer sensor. The thermometer should be placed at in shade but with proper ventilation. It should not be subject to direct sunlight. It should be placed at least 5 feet from the surface where it is installed. The closest paved surface should be at least 50 feet away from the thermometer. Many modern weather stations come with the radiation shield allowing you to place the sensor unit in the direct sunlight. However, sometimes you need to purchase it separately. Most stations also feature aspirators that provide proper ventilation to the thermometer. The anemometer should be placed in an open space. It is best to install it on the rooftop. However, if you must install the weather station on the ground, anemometer should be at least 10 feet from the surface. The surroundings play an important role in determining weather or not the rain collector provides accurate information. Tall nearby buildings create obstruction and affect the rain data. Again, it is best to keep the rain collector as high up as possible. Usually, rooftop is the best place to mount the device. Humidity isn’t usually affected by the obstructions. However, a nearby water body will have a direct impact on the humidity reading. It is best not to have a large leafy tree or a substantial water body anywhere within 50 feet of the weather station. Still not clear about Weather Station? Watch the below video by Musselman where he explain How Weather Station Works. Finding the perfect Weather Station is never an easy task. That’s when our site comes into play, we listed the products which are of top-notch quality and we make sure that it will be a worthful investment for you. Our main goal is to guide the buyers to choose the products which will suit there needs. 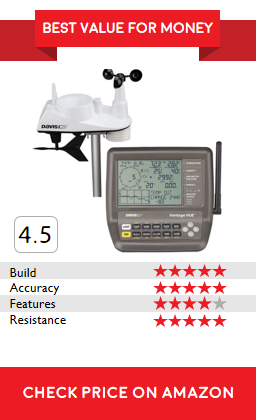 We hope the recommendation list helps you to pick the best weather station within your budget. We have recently added the Weather Forecasting Station which are for budget-oriented customers. If you think, there are better weather instruments which should be listed here, let us know. Our goal is to be your one stop destination for all your weather station related queries. That’s why we’re continuous mission to be updated with good and quality content. WeatherStationLab.com participates in the Amazon Services LLC Associates Program, an affiliate advertising program designed to provide a means for sites to earn advertising fees by advertising and linking to Amazon.com. Amazon and the Amazon logo are trademarks of Amazon.com, Inc. or its affiliates.